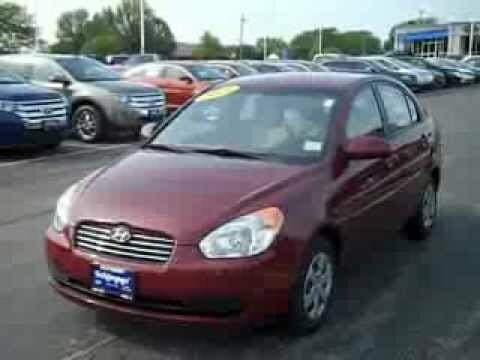 If an ultra-practical and affordable subcompact is your next vehicle purchase, you'll appreciate the 2008 Hyundai Accent's value, which includes numerous safety features, a long warranty and unusual availability of accessories. If your driving aspirations are bigger than your budget, you should also appreciate the SE three-door's sporty look and surprisingly responsive handling and cornering capability. No issues with the car beyond complications coming from the accidents the car has been involved in. Very reliable and a great first car! I have driven the car for almost 6 years, have put about 80, 000 miles on the car (it is at about 110, 000 miles now). I'll be getting a new car in the next few months just because the car no longer meets my needs, but will likely be driven by one of my family members until the wheels fall off! Great car, especially for being 10 years old now. I have the very basic package, so the car has crank windows and manual locks (not ideal for a young female in terms of safety). Still a great car and served me well as my first car!! Hyundai accent- the car that does not give you any problems. I have only had a couple of problems with my Hyundai accent in the last 8 years. The one that sticks out the most is every 5 ish years or so, the gas pedal and the rpm gauge get off from each other which causes the car to stall and then jump forward when I put the gas down hard. It is a cheap fix. It is plenty comfortable for my needs, rather small if you were a tall person. I does not have any bells and whistles, which is exactly how I wanted it. However, it does have an auxiliary port, which is essential. Takes a licking. And keeps on ticking. This car switched me over to being a loyal Hyundai owner. I wanted a solid, reliable car. With no air conditioning, , or radio, or power windows. I have 195, 000 miles on it, and with basic maintenance, it will be my driving buddy for many more. I drove 2 hour commute, (each way) in the bay area. And then moved to reno and drove 120 commute to Tahoe to work. This baby makes it through snow too. This is my favorite car. Ever.